Today – April 28th – National COSH and a coalition of worker safety groups are releasing the U.S. Worker Fatality Database, which shows the names, people and stories behind the statistical reports of deaths on the job. It is the largest open-access data set of individual workplace fatalities ever collected in the United States. This unprecedented effort is driven by the lack of timely and comprehensive information currently available from governmental sources: The U.S. Bureau of Labor Statistics (BLS) just released its final report on occupational fatalities... for 2013. And the BLS data omits the names of workers and employers. Why should it be so hard for the public to know who was killed on the job and the basic facts of what happened? 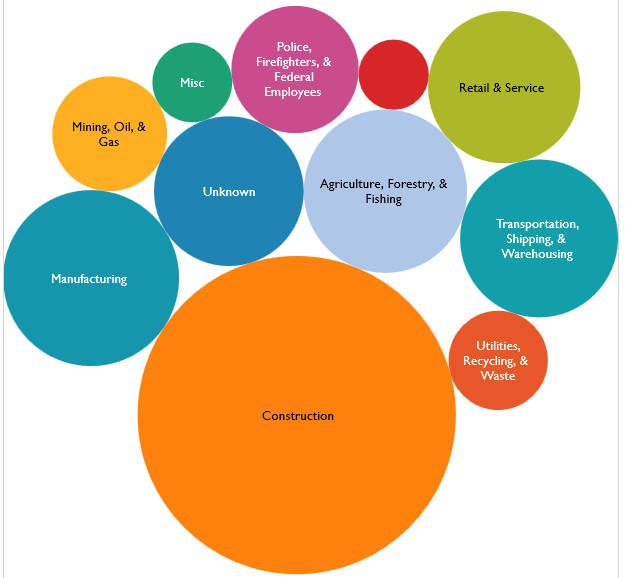 The U.S. Worker Fatality Database identifies more than 1,700 workplace fatalities for 2014. This is likely to represent over one-third of the total cases of workplace deaths from traumatic events for that year. The database includes, where available, the name of the deceased, the employer, and the circumstances of the death, with links to OSHA and news accounts. Interactive maps based on the data show information on specific states and industries in dramatic, graphical form. These maps are licensed under Creative Commons, and can be modified, reproduced and redistributed, with credit to: U.S. Workers Fatality Database.